A reader sent in this Metro Mention: Good Girl Dinette, a Highland Park eatery specializing in Vietnamese food, makes note of its proximity to Metro Rail on its website. The critically acclaimed diner is just around the corner from the Highland Park Gold Line Station. A quick glance at the menu reveals super affordable (nothing over $10) Vietnamese comfort foods – and Jonathan Gold lists the Chicken Pot Pie on his 99 Things to Eat in L.A. Before You Die list. 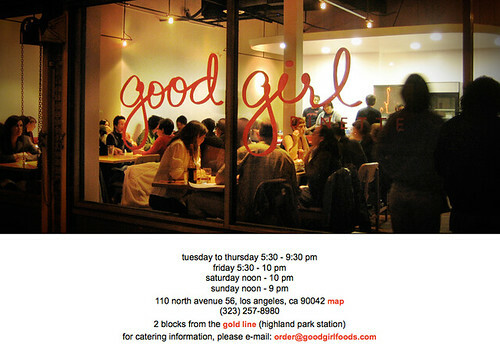 Yours truly is likely going to heed this Metro Mention and hop on the Gold Line this weekend to try out Good Girl Dinette. See, it pays to mention Metro! "2 blocks from the Gold Line" Thanks for the mention! Blue Line stations reopen in downtown L.A.